Musician and staunch NPP member, Kwame Asare Obeng seems to be continuously stirring up the fury of some key members of his party; the New Patriotic Party with his ‘hard’ comments on social media. 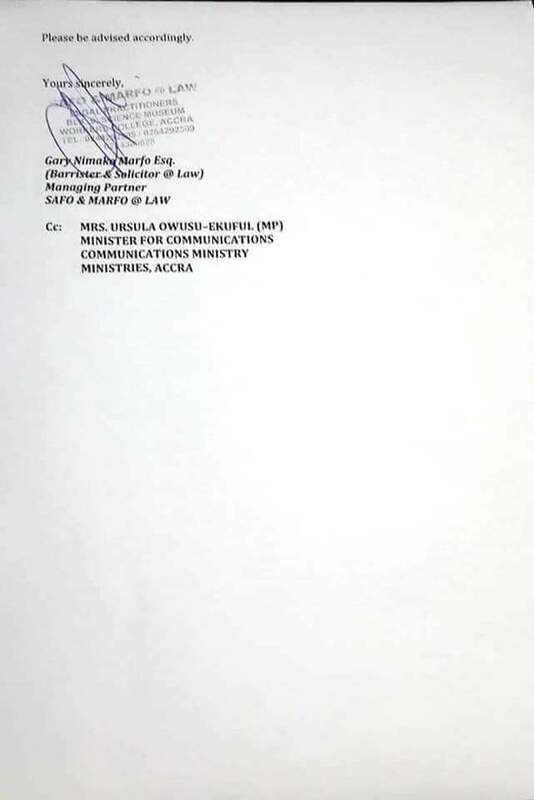 His recent post on the controversial $89 million GVG/Kelni deal particularly has earned him another legal threat from Deputy Chief-of-Staff, Francis Asenso-Boakye, following an earlier one from the camp of Communications Minister, Ursula Owusu. 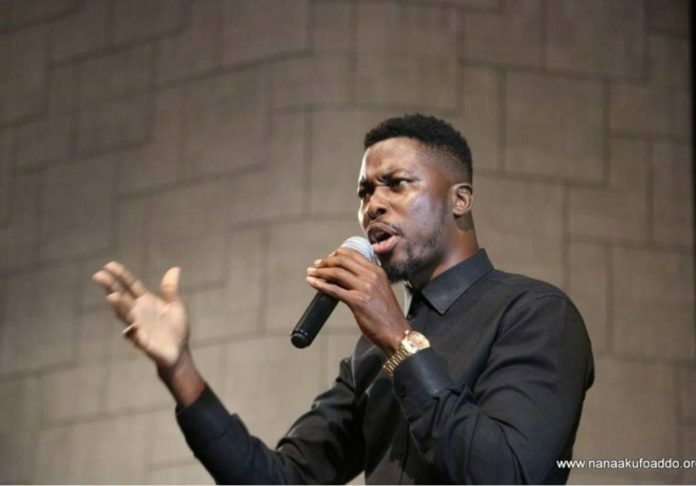 Mr. Asenso-Boakye who previously has had A Plus apologise to him for similar utterances which he found insulting and defamatory has threatened another legal action against him (A Plus) and demanded an immediate apology and retraction of his comments which cite him (Francis Asenso-Boakye) as being corrupt. The release from his legal representative, Sampson Lardi Anyenini, among other things noted that A Plus has “with malice aforethought, waged a sustained crusade with intent to damage and falsely damage their client’s reputation using social media in particular”. The Deputy Chief of Staff who believes reference to previous remarks which led to investigations and subsequent clearance from any corruption allegations is a clear indication of ‘impunity’ and ‘disregard’ for the lawful, constitutional official and quasi-judicial processes that discredited the said allegations and gave their client a clean bill of health in respect of same through due process”. A 7-day ultimatum was therefore given to A Plus as the period within which he should respond and apologise accordingly, after which legal suit would follow. 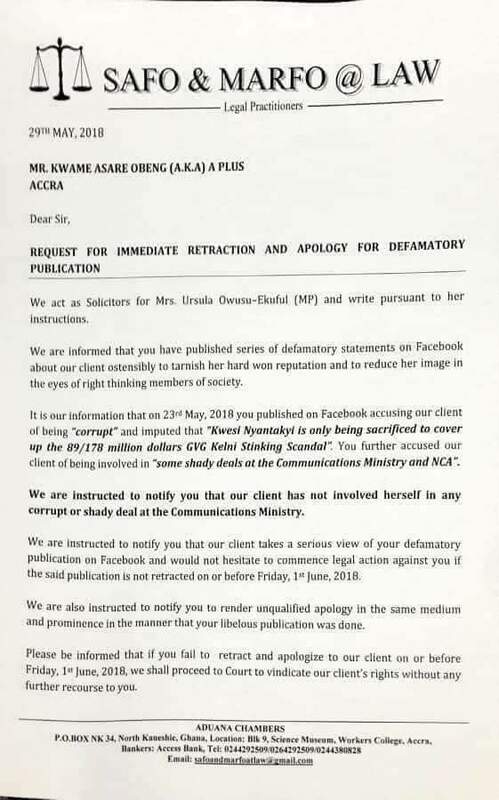 This comes following Communications Minister Ursula Owusu’s earlier threat Tuesday May 29, to sue the musician if he fails to apologise and retract statements he made suggesting her involvement in some corrupt activities. The unperturbed A Plus has however, since the threat from Ursula, responded, calling her bluff and telling her to ‘leave him out of their nonsense”. “If I apologise, Nimokafui and Ayetefrem and chalabim and Salafim should kill me. You think this is 2017. I only helped you to win power. I’m not part of your nonsense. I’m not afraid of anyone. Not a single soul. I’m wild like a lion!!! Bring it on, you’ll be humiliated!” he wrote on his Facebook wall. “And for those saying I’ve been sued, for your information I’ve been sued since 1999…. Even Richard Anane threatened to sue me. Any idiot can go to court!! !”, he said in a separate post on his wall. Kwame A Plus, prior to this had accused Mr. Asenso Boakye and his colleague Deputy Chief-of-Staff, Abu Jinapor of engaging in corrupt activities as far as their intervention in the termination of a revenue collection contract between the Korle-Bu Teaching Hospital and Unibank is concerned. He accused President Akufo-Addo of appointing thieves and corrupt officials in his administration. “…7 months of NPP government. So far so good except appointing some very corrupt official including the two very stupid deputy chief of staff. It’s amazing how Nana was able to appoint two thieves whose level of stupidity is the same. Arrogant and corrupt fools. You think you’ll be in power forever. Even John Mahama I was not afraid of him then you (sic),” A-Plus stated. He subsequently apologized to both officials, retracting his ‘corrupt, arrogant’ tag and suggesting rather that they were misled and acted on deception when they intervened in the termination of UniBank’s contract to provide onsite banking services at the Korle Bu Teaching Hospital.